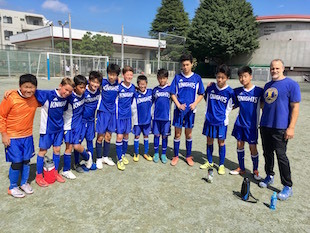 CAJ's two middle school soccer teams combined to play three games against YIS and St. Maur on Saturday. The A Team lost 2-0 to YIS, and the B Team beat YIS 6-1 before beating St. Maur 4-3. "Our players seemed very discouraged after the 9-0 loss to ASIJ, but then expressed the following week their intentions to challenge themselves and to make improvements in their game. They worked very hard for the last two weeks or so and made lots of improvements in their overall rhythm in passing, cohesiveness and attention to extra details. They seem to have finally started to understand how the game ought to be played. This loss comes just in the wake of that. We had two great shots by SuYoung and Minoru hit the goal posts, but they came away with a win by capitalizing on our minor mishaps. It was the best game we played this season so far, and I am very excited about their progress. They are definitely playing some great soccer right now and are remaining optimistic and highly motivated from the quality of their own plays. I want to take this time to thank the parents of our players who came out to watch us on our Parents' Day home game. I appreciate their compliments on [the team's] noticeable improvements on the field. We will continue to work hard, not only on the field, but also off the field with how we ought to carry ourselves and how we ought to treat one another." B Team coach Charles Smoker was happy that the Knights got their first wins of the season against other B Teams. In both matches, CAJ turned it on at the end of the game to win. The Knights had the last four goals of the game against YIS and came from being behind 3-2 against St. Maur to win. "We've been working hard for a few weeks to prepare to get our first wins of the season. We've been focusing not just on winning, of course, but on teamwork and concentration. We need guys on CAJ sports teams to be willing to sacrifice for their team. We've been working through some of those issues throughout the season and it really paid off for us today. We're thankful for the victories, but we're more thankful for the guys growing together as a team and sacrificing for each other throughout the day. Team-first rather than me-first." In the B Team's two games combined, Eastin and Simon had two goals and one assist, Jay had one goal and two assists, Elijah had two goals, Junu, Ronald and Kenny had one goal apiece and Christopher had two assists.